In 1968, Washington, DC architect John Wiebenson was asked to design an instant, temporary city for thousands of protestors organizing as part of Martin Luther King, Jr's Poor Peoples' Campaign. Originally conceived as the City of Hope, Resurrection City was built on the National Mall in May, just weeks after King's assassination. 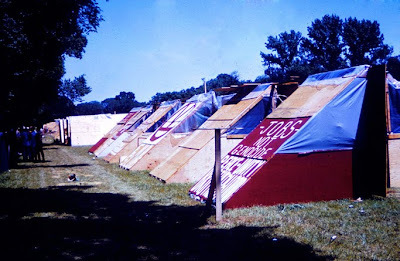 Around 3,000 impoverished protestors built and lived in modular, triangular plywood shacks for six weeks. Wiebenson and his students at the University of Maryland designed two types of shacks: a family unit and a dormitory unit. 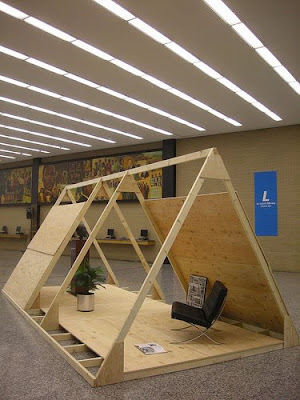 In 2009, while on a research grant to the Library of Congress, British conceptual artist Matthew Thompson tracked down and exhibited the original drawings, plus the Wiebenson family's photos of the construction of Resurrection City, at DC's Martin Luther King, Jr. Memorial Library [which was designed by Mies van der Rohe]. Thompson also built a full-scale Resurrection City dorm shack, which he furnished with a Mies chair and the library's bust of King.